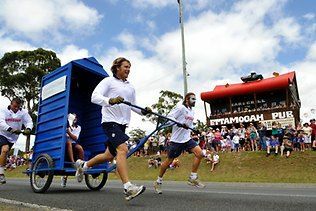 Aussie World on the Sunshine Coast is the place to be this Australia Day. Festivities on the day (Thursday 26th January 2017) include the famous Dunny Races, Tug of War, Mullet Tossing and great kids activities and entertainment. Bring the whole family to this fun day out with festivities starting from 8am in the adjacent Aussie World oval. Why not take advantage of discounted tickets into Aussie World (50% off ride passes) or Australia Day concert ($10) take part in this great day out the Sunshine Coast theme park. The concert begins at midday where The Shed will host 4 hours of live music covering some of our greatest Aussie rock legends. Why not bring the family and enjoy a long weekend on the Sunshine Coast with fantastic Maroochydore accommodation. Reflections Apartments on the Sunshine Coast is the perfect Maroochydore accommodation option for your next getaway. Take advantage of the prime Maroochydore riverfront location whilst being a short walk to Sunshine Plaza, parks, restaurants, cafes and entertainment. Bring the fishing rod, tinny or stand up paddle board with the Maroochy River one of the best fishing spots and its flat water is perfect for the stand up paddle boarder. Offering a great range of fully self contained 1, 2 and 3 bedroom apartments, Reflections is ideal for singles, couples, families and groups. All apartments feature a well equipped kitchen, spacious interiors, modern decor and private balconies to enjoy the riverfront vista. What are you waiting for? Why not stay for a few extra days, enjoy the festivities at Aussie World and then relax at this fantastic Maroochydore accommodation.